But in our digital conversion of media (perhaps buttressed by application of the popular KonMari method of decluttering), physical objects have been expunged at a cost. Aside from the disappearance of record crates and CD towers, the loss of print books and periodicals can have significant repercussions on children’s intellectual development. Perhaps the strongest case for a household full of print books came from a 2014 study published in the sociology journal Social Forces. Researchers measured the impact of the size of home libraries on the reading level of 15-year-old students across 42 nations, controlling for wealth, parents’ education and occupations, gender and the country’s gross national product. I gathered these entries from various sources such as Facebook, Twitter, Goodreads, and specific sites that I follow such as Educating Alice, Pub Peeps, Book Riot, School Library Journal, The Horn Book, We Need Diverse Books, etc. 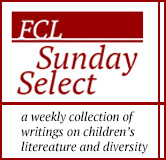 Some lists were already announced and included in other issues of FCL Sunday Select. They are not repeated here. It is always of interest to note the varied opinions from different venues: booksellers vs professional review publications vs popular review platforms. I can’t change the color of my skin or where I come from or what the teacher workforce looks like at this moment, but I can change the way I teach. So I am going to soapbox about something after all. Be the teacher your children of color deserve. In fact, even if you don’t teach children of color, be the teacher America’s children of color deserve, because we, the teachers, are responsible for instilling empathy and understanding in the hearts of all kids. We are responsible for the future of this country. So teach the texts that paint all the beautiful faces of our children and tell the stories of struggle and victory our nation has faced. Speak openly and freely about the challenges that are taking place in our country at this very moment. Talk about the racial and class stereotypes plaguing our streets, our states, our society. You may agree that black and brown lives matter, but how often do you explore what matters to those lives in your classroom? It was interesting to hear my White students say that they think that books do a good job of representing diverse characters. My students of color at this time did not say anything. I did not add to the conversation and I ended the conversation at this point. It was eye opening to my students. My White students seemed surprised by what my students of color were sharing. I then wrapped up our conversation saying that history and books often overlook certain groups of people and that this year we will be learning about many points of view. I gathered these entries from various sources such as Facebook, Twitter, Goodreads, and specific sites that I follow such as Educating Alice, Pub Peeps, Book Riot, School Library Journal, The Horn Book, We Need Diverse Books, American Indians in Children’s literature, etc. While the burden of mistakes can be placed on the author and illustrator, in truth publishers share an equal part of the responsibility in making sure that the books they produce are accurate and do not reinforce harmful stereotypes. This week, I am featuring only ONE industry news link here, because I don’t want to dilute its significance. Hopefully, we’ll start hearing from other publishers, large and small, that take their staff on this worthwhile journey. As an educator who partook in similar trainings in recent years, I have to say that I believe everyone in the United States should have the experience of going through such tough journeys: self-examining, questioning, and re-affirming ideologies that will help create a more equitable society for our own future. Updated — I have now included also the entire Panel discussion — which Sean Qualls & Sophie Blackall also shared their views. They all do not agree with each other. Around 26:00 — Sophie Blackall talked in details about her own reactions toward the controversy over her book A Fine Dessert; 35:00 – Sean Qualls starts talking; 38:00-ish, he touches briefly on A Fine Dessert; keep watching and you’ll hear Susannah’s views as well. Collected below are various online articles, conversations, and comments about the picture book A Fine Dessert written by Emily Jenkins, illustrated by Sophie Blackall, published by Schwartz & Wade, an imprint at Random House. The book has been under careful scrutiny by many – when it was highlighted as one of the Caldecott hopefuls, when it was among the 10 illustrated books of 2015 chosen by The New York Times, and when it received objections by readers who found certain text and images hurtful. I did not read or look at the book until this past Monday, after many others already grappled with the book for a while. The conversations are important to note and should continue, not only about one book, but about the entire Children’s Publishing industry. More on that from my own viewpoint is forthcoming. Since Debbie Reese has been diligently documenting and collecting all the pertinent links. I’m providing only ONE link here in this section. Do read as much as you can and consider and re-consider! Africa is not rich or poor, educated or illiterate, progressive or archaic. What Africa is depends on which part of it you are referring to. No single story can adequately reflect that, but a multiplicity of stories can and should broaden our received wisdom about the continent. With more platforms and opportunities than ever before, there has never been a better time to challenge that confusing and costly concept of a single African story.